There have been some great sightings in the past week, and a lot of species are on the wing right now. Dwayne and Mary Sabine had an Eastern Tailed Blue in Douglas, NB, and an Indian Skipper at near Brockway, NB. Eastern Tailed Blue has two generations annually; this is the first ever record of a “first generation” individual from the Maritimes. Take a close look at the small blue butterflies that are flying these days, you may be surprised to find Western Tailed Blue, Eastern Tailed Blue, or Greenish Blue. 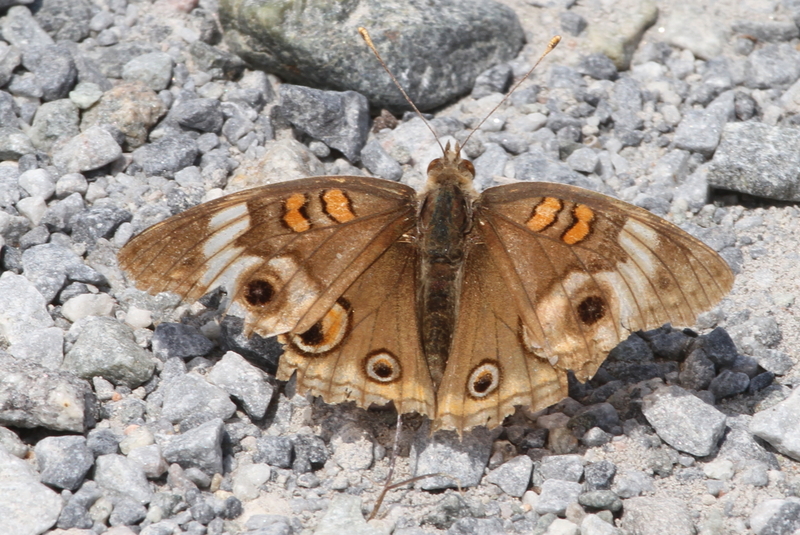 Merv Cormier photographed a very worn Common Buckeye at Rockwood Park in Saint John on June 20 (see photo below). This is likely the first ever June Buckeye record for the Maritimes. The species, which is a vagrant in our area, seems to now be recorded more or less annually in NB, but previous records have been from the mid summer and early fall. Common Buckeye – photographed by Merv Cormier on June 20 at Rockwood Park in Saint John. Linda Brown recorded a Baltimore Checkerspot at Kentville, NS, on June 19. In 2010 and 2011 there was only record of this species from NS. Pepper and Salt Skipper and Common Roadside Skipper have been reported in NB this week, and the latter was seen north of Amherst, NS, on June 16 by Sarah Robinson, Kathleen Spicer, and myself. Keep your eyes out for these small dark skippers, particularly in NS where there currently are very few records. Neither of these species have ever been recorded in PEI, but both are possible there. 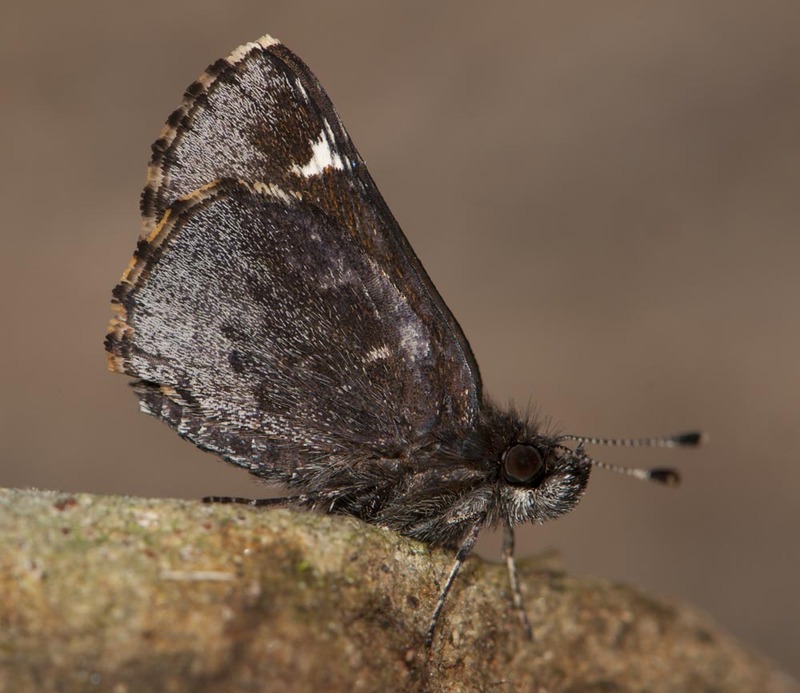 Common Roadside prefers drier sites, such as edges of forest roads, Pepper and Salt Skipper prefers wetter sites, such as sites along streams and trails through wet woods. Common Roadside Skipper – photographed by John Klymko north of Amherst (45.8971N,-64.1213W) on June 2. The species was seen again on June 16 near this location. 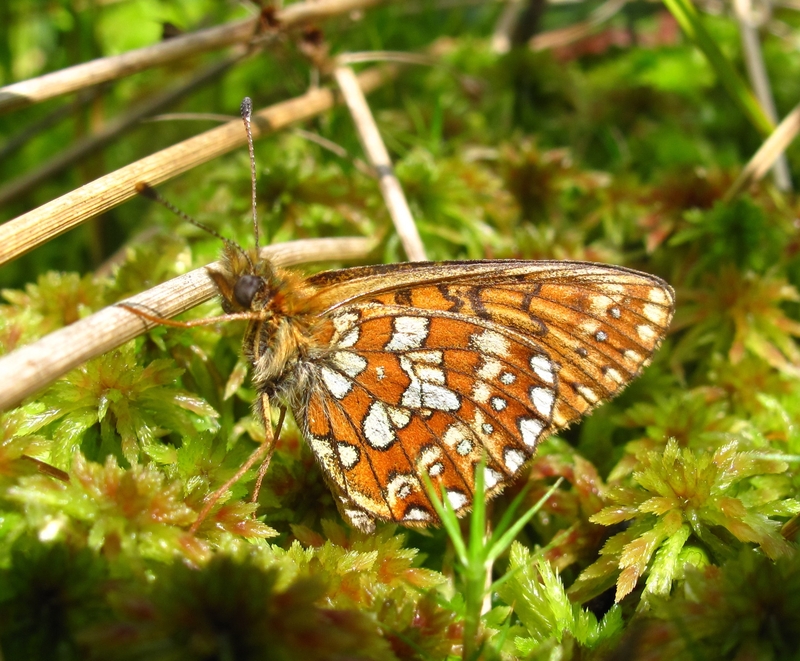 Another species worth looking for these days is Bog Fritillary. This butterfly is known only from a handful of bogs in the northern NB and has a short flight period that spans the latter half of June. If you do go searching a bog you could also turn up the Maritimes’ first record of Frigga Fritillary, though it may already be getting late for that species. Bog Fritillary – Photo by Jim Edsall.